I realize that we are late to this conversation…too late, really. 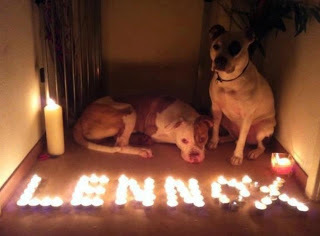 Lennox is gone. It never occurred to me that he would actually die. I truly believed they would do the right thing. When I first saw the emails going around, I thought it was just another pit bull type dog who needed help. There are so many. However, when I read more-that he was taken away from his family just because of the way he looked, it only made sense to me that the people in charge would come to their senses. 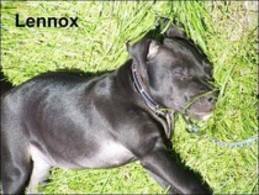 His family desperately wanted him back, and Lennox was a good dog. It was distressing to see the pictures of him, healthy and happy in his home and the obvious decline of his health in the pictures from his days in captivity. I think many of us were saddened but knew that once people came to the obvious decision and returned him home, he would be ok. So, he isn't ok. They didn't come to their senses. It is horrible, and now I think it is time that a lot of us come to the table on the Breed Specific Laws before it is too late again. Pit bulls may not be your breed. You may feel like you have your hands full, as a rescuer just getting through each day…but this case makes it clear that some of the people making decisions do not make the same decisions that dog people would make,so you have to ask yourself-WHAT BREED IS NEXT? Will they come knocking on your door and take away your baby?